I was laying in the hammock on the front porch, reading a book and texting with a couple of people when I heard my 7-year-old son Ben crying and moaning. Along with his dad, he was out of sight but obviously in ear range on the other side of our pine forest burning some brush. When they lit the fire, it flared up and Ben was too close. I knew something was wrong when I heard my boy, so I rushed through the house, grabbed my rain boots and ran through the forest to the guys and the burn pile. I saw Greg spraying Ben with water. As soon as they told me what happened, I knew we needed to go to the emergency room. There wasn’t evidence of burns yet, but Ben was clearly in pain. We walked quickly back to the house, changed Ben out of his wet clothes, got more comfortable shoes for me, put more water on his hands, and took off for the local ER, which is about 15 minutes away. Long story short: Ben was transferred to Vanderbilt Medical Center, where he spent two nights in the burn unit being treated for second-degree burns on his hands and face. Recovery is expected to take two weeks and is progressing well. There’s a lot I could tell you about these circumstances and what they’ve done for our family. Obviously, Ben has suffered pain, but the emotions have been all over the place for all of us. We’ve been scared and worried and relieved and thankful. Our family of five has been changed – in good ways – because trauma offers perspective. But what I want to tell you about is how our community of people – our closest friends, acquaintances who want to help, school friends, church friends, Facebook friends who get peeks in our lives – has surrounded us with prayers, encouragement, meals, supplies, medical advice, and their presence. Seeing the church in action is beautiful. My son’s face has grown new skin already and his hands are raw but doing the same. I’ve shed tears because seeing my boy uncomfortable is hard and caring for him involves a whole new skill set for me that’s been overwhelming. But even more powerful than all of that has been how we’ve been overwhelmed with the love and prayers. When I told Ben how hundreds of people were praying for him, he was amazed. Truly, I am too – not because I doubt God or my friends but because coming alongside trauma can be hard. I’ve gotten so many texts that offer prayers and love. People ask what they can do with genuine kindness. Friends have done things like show up at my house with Dilly Bars and a prayer spoken aloud over my boy, fasted for a day because she wanted to pray for us, given of their time to help Ben with his stretches that he doesn’t always want to do for his parents, brought meals and treats, and run my errands. Some of our neighbors have shown up at our house, where Ben doesn’t usually wear a shirt and has a Vaseline-like medicine all over his face. Others have shown up in texts and on Voxer. Some of sent love through the postal service. Regardless of where they are, I’m grateful they’re my neighbors and have showed up in my life, especially this week. And, truly, our neighbors who are friends have helped my son heal. Ben is 100% extrovert and was asking if people were coming to visit before we left the hospital. So I’m glad they showed up because that’s what helped him to get up and moving his hands. He’s played the Wii with almost everyone who has walked in our house and forgotten that his hands were wrapped in gauze. This is what friendship is about. It helps us heal from trauma and reminds us that even the scary stories can have beauty. 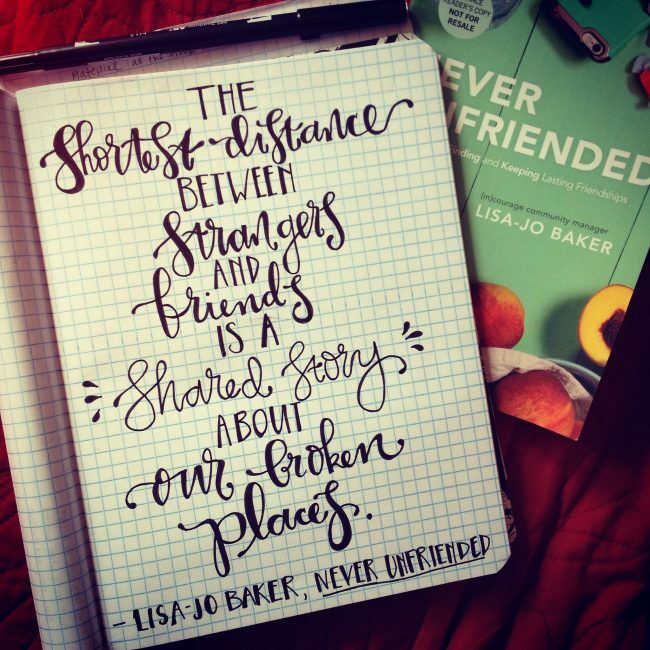 Lisa-Jo Baker’s “Never Unfriended” spoke deeply into my friendship-loving soul, but it’s more than a book about friendship. I expected to like this book because I appreciate Lisa-Jo Baker’s encouraging writing and friendship is one of my favorite topics in life. I didn’t expect this book to seep into so many areas of my life – my marriage, my relationships with my kids, my friendships (of course), hurt from my past I may not have fully dealt with, and my everyday faith. But this book is powerful and rocked my thinking in ways that have changed me as a friend, yes, but even more deeply as a Christ follower. I was on the “Never Unfriended” launch team and received an advanced copy of the book to read and review, but I really love it so much I’ve already ordered another copy to share with a friend. Learn more about the book at its website or Amazon. So much THIS: “Being willing to be a neighbor in the heart sense of the word is being willing to connect with the people who God puts in our path. It’s doing life together, especially the hard parts. It’s choosing friendship on purpose.” Praying for all of you especially Ben. Love you sweet friend! Thank you for your prayers, Tara. I’m grateful for the way God works through his people. What a blessing to see the Christian community step up to offer help and prayers! I’m so sorry you all had to go through this, but I’m so glad to hear his burns are healing well. As a mother, I can identify with you and your concern and pain for your son. I pray healing will continue and am thanking God for the outpouring of love you have felt. Thank you for your understanding & prayers, Gayl. Without the community of people to pray and help, I’m not sure how we would have made it through this week. Oh Kristin! I’m so grateful your boy is recovering. Two of my kids suffered second degree burns as toddlers and I remember how heartbreaking it was (and how helpless I felt). I’m so glad He’s ok, and I’m praying that God continue to come in His gentle healing for both of you! So heartbreaking! I’m so grateful for the medical care we have available! Thanks for your prayers, Becky!